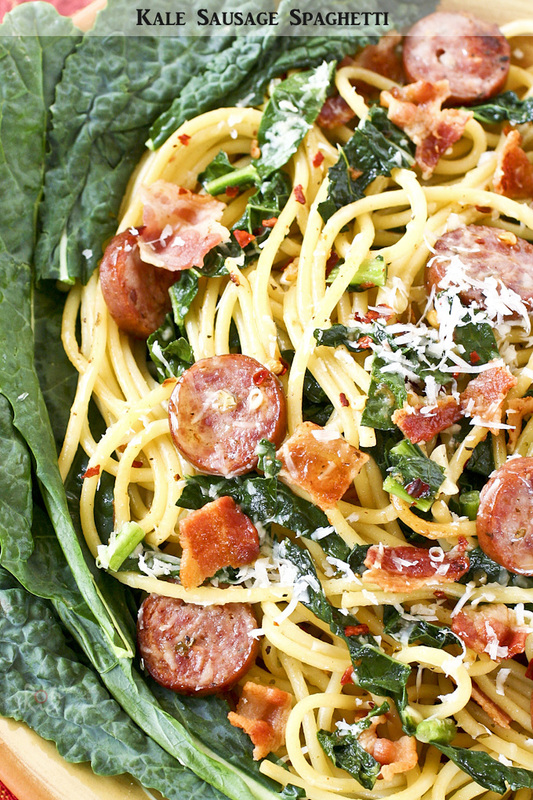 Kale Sausage Spaghetti – a pasta with bold flavors combining Polish sausage, earthy kale, spicy red pepper flakes, garlic, and bacon. If you have never tried kale, I urge you to do so. It is a robust vegetable with a pungent and slightly peppery flavor. Kale is delicious in soups and stir fries. 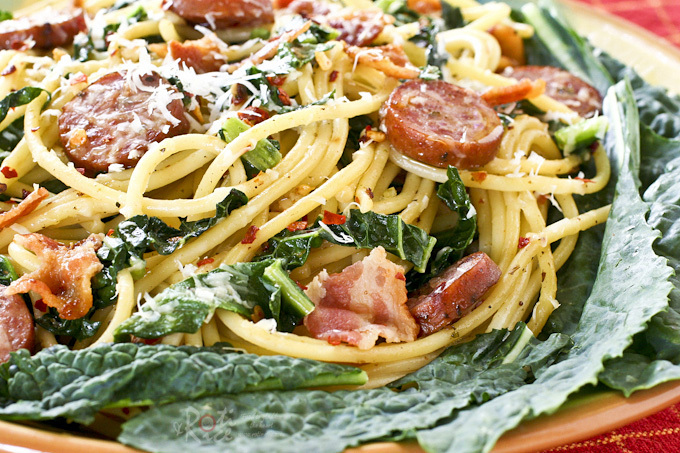 Today’s Kale Sausage Spaghetti combines this earthy vegetable with tasty Polish sausage, spicy red pepper flakes, garlic, and bacon. There are a few recipes on this blog using curly kale, the most commonly found variety with crunchy blue-green ruffled leaves. Here are the other noodle recipes with curly kale on this blog. Please click on the picture to get to the post. This time round, I chose to use dinosaur kale also known as Lacinato or Tuscan kale. It has huge deep green leaves that are palm-like with an “embossed” texture. The flavor is slightly sweeter and milder than curly kale. This Kale Sausage Spaghetti was really tasty. Even though the dinosaur kale did not have the crunchy texture of its curly cousin, it was mild, sweet, and smooth. It also gave the dish a nice contrast of colors. 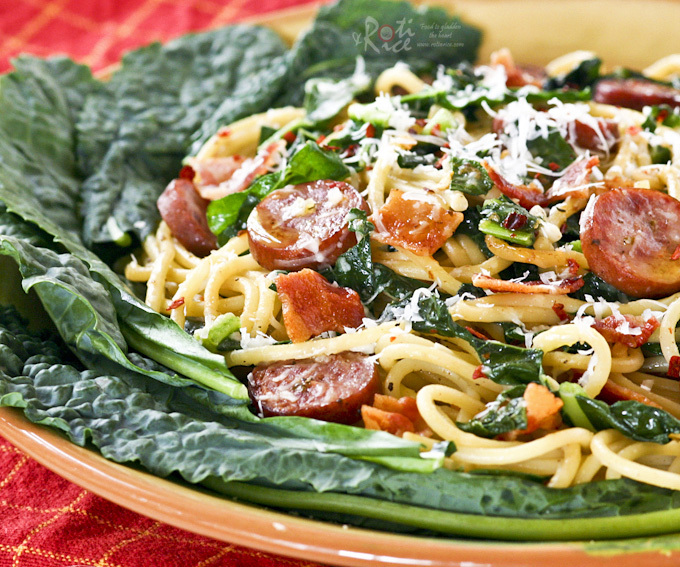 Kale Sausage Spaghetti - a pasta with bold flavors combining Polish sausage, earthy kale, spicy red pepper flakes, garlic, and bacon. In a large pan, cook bacon until crisp. Drain on paper towel and crumble into bacon bits. Set aside. Pour away bacon fat. Boil spaghetti in lightly salted water until al dente, about 8 to 10 minutes or according to packaging instruction. While pasta is boiling, reheat the large pan used for cooking bacon with olive oil. Fry sausages for 3 to 4 minutes until lightly browned. Add garlic, Italian seasoning, and red pepper flakes. Stir for 1 minute. Drain spaghetti, reserving 1 cup (240ml) liquid. Add spaghetti, salt, pepper, and reserved liquid to the pan. Toss to coat pasta with sauce. Add kale and continue to stir until kale is wilted. Turn off heat. Sprinkle crushed bacon on the top. I am excited to show you our fully completed service patio at the side of the house. After two weeks of back breaking soil work and brick laying, it is finally done. We are really pleased at the way it turned out. 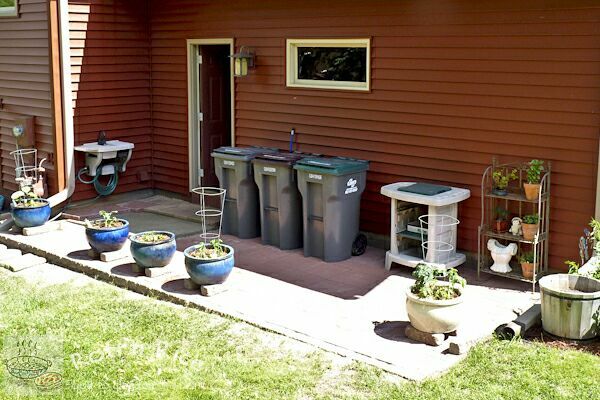 Now, I have a sunny spot for my vegetable container gardening. So far, I have eggplant, zucchini, broccoli, patty pan squash, orange bell peppers, and 3 varieties of tomatoes in those pots. For now, there are only 3 types of herbs on the shelf – basil, mint, and thyme. Will put putting in more. Please check out my Facebook Fan Page for more pictures on this Service Patio Project. 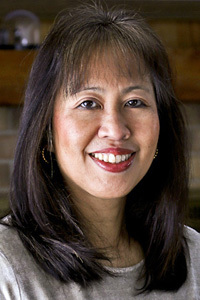 While you are there, I would be delighted if you would “like” my page. Thank you! Since we enjoy kale so much, it might be worthwhile growing some dinosaur kale. According to the Vegetable Gardener they are pretty fast growing. That is a good thing as the growing season here in Minnesota is relatively short. I must say the plants do look quite attractive too but that is a project for next year when we cut a vegetable plot at the end of the yard. Kale does remind me of my favorite gai lan. I love it in stir fries but have never used it in stews.